It's up against some stiff competition, but there's a runaway front-runner in the "wrongest idea of 2016" derby. It's the aphorism, once fashionable on the morning-talk show circuit, that the media mistakenly took Donald Trump "literally but not seriously," when they should have taken him "seriously but not literally," as Trump's supporters did. Almost all of the actions that Trump has undertaken, however, are consistent with statements and policy positions he issued repeatedly on the campaign trail and during the presidential transition. It was more than a year ago that Trump called for a "total and complete shutdown of Muslims entering the United States," for instance. (Friday's executive order stops short of that, but Trump allies such as Rudy Giuliani have spoken of the order as a legal workaround that seeks to accomplish the same objectives as a Muslim immigration ban.) Another executive order called for building a border wall with Mexico, which was perhaps the signature policy position of Trump's campaign. And Trump might even try to "make Mexico pay for it" by imposing a tariff on Mexican imports - although most economists argue such a tariff would really make American consumers pay for the wall, via higher prices. Trump and Congress have taken initial steps toward dismantling Obamacare. He promised that too, although he also promised to replace the Affordable Care Act with "something terrific," which should give pause to Republicans hoping to repeal the plan without a replacement in place. Investigating (highly dubious accounts of) voter fraud? Trump talked about that plenty of times on the campaign trail. There's been no "pivot," and there have been no half-measures. Trump is doing pretty much what he said he'd do. Literally. Why, then, does Trump's first week and a half in office seem so surprising, even to those of us who weren't expecting a kindler, gentler Trump? One could wryly remark that it's a surprise whenever presidents actually keep their promises. But a longstanding body of research from political scientists suggests that this shouldn't be a surprise. Presidents actually do make a good-faith effort to keep most of their promises. Both Nixon and Bush, however - although they'd later become polarizing presidents - adopted conciliatory tones during their transitions into office. Hardly a partisan word can be found in Nixon's 1969 inaugural address or Bush's in 2001. They began their presidencies as relatively popular presidents, therefore. Gallup's first approval rating poll on Nixon had 59 percent of the public approving of him, against just 5 percent disapproving. For Bush, the numbers were 57 percent approving and 25 percent disapproving. Trump? He started out with 45 percent approving and 45 percent disapproving in the Gallup poll, and his numbers have already gotten worse since last week (although we'll need more data to confirm whether that's a meaningful trend). So Trump's governing like he's Franklin D. Roosevelt in 1937 or Ronald Reagan in 1985, presidents who won via record-breaking landslides. But Trump's popularity measures are more like those of an embattled president a couple of years into his tenure - think Bill Clinton in 1995, for example. 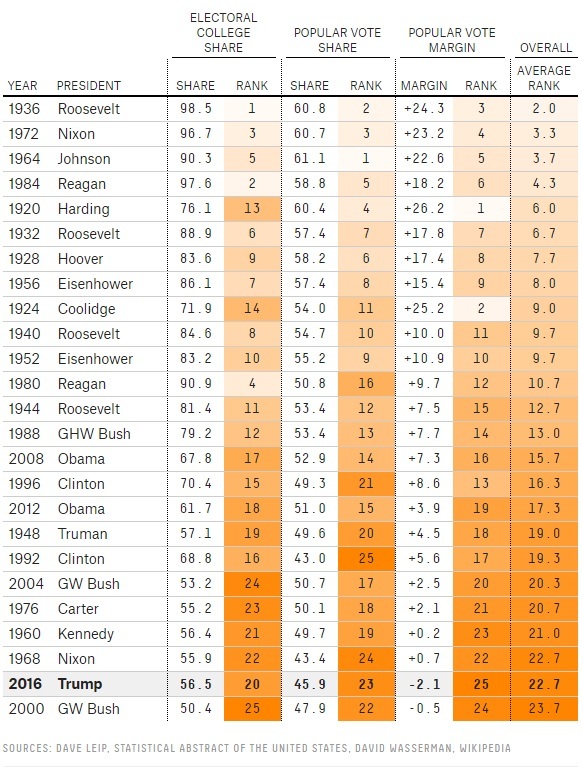 Those low moments don't necessarily doom a presidency; they didn't doom Clinton's, and Reagan and Barack Obama also endured bouts of unpopularity before being re-elected. But we're in uncharted waters to see a president who is so unpopular so early in his term - and yet who is plowing ahead so stubbornly (or so resolutely, if you prefer) with his agenda. Then again, this was the agenda Trump promised the country, more or less. So here's my question: Was Trump elected because of his agenda, or despite it? I don't have a good answer to this question yet, but it could be the one that Trump's presidency turns upon. If his supporters took him literally, they'll presumably see a lot to like so far. But many of these policies have tenuous public support beyond Trump's base. If this is the framework, then Trump is just continuing with the strategy he's bet upon all along - doubling down on support from his base - and his approval ratings will probably oscillate within a relatively narrow band of 40 percent to 45 percent support. With Republicans controlling both chambers of Congress and having a geographic advantage in the way their votes are distributed, that mediocre rating wouldn't necessarily do much to constrain Trump in the near term, although ratings toward the lower end of that range might be enough to make the House of Representatives competitive in 2018. 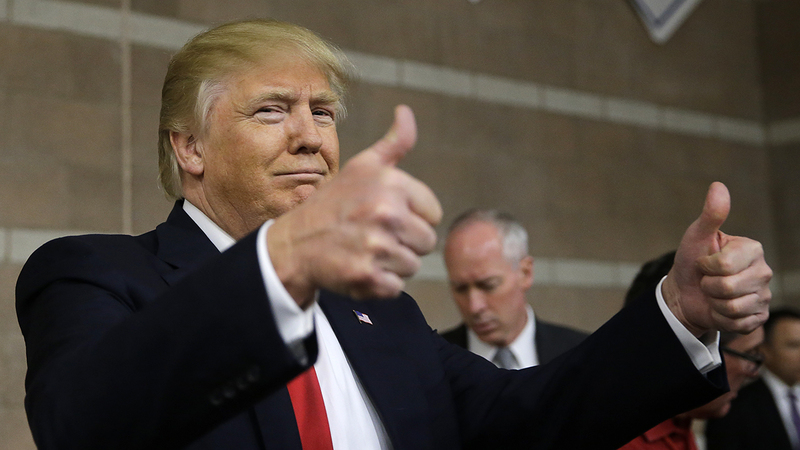 If Trump's supporters didn't take him literally, however, the downside might be greater. There are quite a few Trump policies, including greater restrictions on immigration, that are fairly popular in spirit but became unpopular when taken to the extreme that Trump takes them. Other voters may have felt they were in on the joke when Trump was running against the staid, politically correct establishment, but will hold him to a higher standard of responsibility now that he is implementing policies rather than just talking about them. Perhaps they'll give Trump some credit for keeping his promises, but those promises weren't very popular ones. If nothing else, the few naive elites who expected Trump to turn into some sort of moderate, Arnold Schwarzenegger clone are likely to be disappointed. They should have taken Trump at his word - literally.